At WWDC 2018 macOS 10.14 or macOS Mojave was disclosed. I am currently on macOS Sierra (10.12) and am looking forward to upgrading to macOS Mojave once its released. I was wondering if it will be possible to update to macOS Mojave without converting to APFS, similar to this trick from OS X Daily on how to upgrade to macOS High Sierra (10.13) without converting to APFS with the command /Applications/Install\ macOS\ High\ Sierra.app/Contents/Resources/startosinstall --converttoapfs NO. Currently it seems very difficult, but doable to upgrade to Mojave, but not directly. Currently it seems very, very difficult, but doable to update (in) Mojave. Similar to avoiding APFS conversion on High Sierra upgrade, only this time you need to go the clone route. But there are a few catches to this. Mojave will boot from HFS+, once installed on it. The installer will convert the drive where it is being installed on, no matter what. The command-line option to skip conversion is gone. Apple really wants to enforce APFS adoption. That means you need to install Mojave on a separate volume, which will then be in APFS format. Then you need to reformat your internal main drive that is the real Mojave target as HFSplus. Now clone the external volume to the target. Reboot into Mojave –– and keep the external drive as a mule. App Store app (fromerly Software Update) will currently not work when Mojave is booted from HFSplus. It will launch and update properly when running on APFS. That means on system updates you need to reboot your APFS mule, update there, then reclone the updated Mojave to your internal work drive (perhaps by inteligently excluding the /Users folder ?). It is unclear what else might break by this method. It seems to run 'fine' in terms of functionality, and it seems to run even better thanks to HFSplus. Disable booting from HFS+ completely. If you care for the latter, like I do, write to Apple that you want that feature. Fast, Urgently, It's Mandatory. 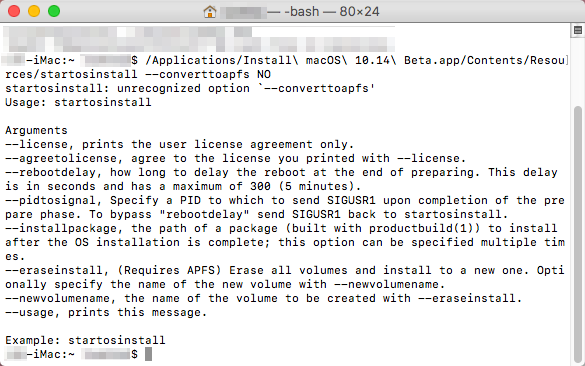 --converttoapfs isn’t a recognized option in startosinstall. Just follow this post https://www.insanelymac.com/forum/files/file/944-mojave-mbr-hfs-firmware-check-patch/, it works for me and I have the same setup just as you (10.12 preparing for upgrading to 10.14). Download the attachment named MBR-Auto-Method14-20181003.dmg from the link above (it requires you to log in, and registration is free). Open the file you download and unzip OSInstaller.MBR.10.14.0.18A391 inside that DMG file. Open Disk Utility, create a new partition at least 2.5GB. This will be used as MBR-installer boot disk later. Open unzipped folder double click 14MBRinstallerMaker, input your password to access root. Now drag Mojave installer downloaded from App Store into the Terminal. After that, drag the new partition (MBR-installer boot disk) you created in step 3. And lastly, drag the partition you have installed macOS into the terminal. In this case, the installation would take place in the partition where your macOS installed. Namely, it would upgrade your macOS instead of new installation. Press any key to execute the creation of the installation process and bob's your uncle, fanny's your aunt! It should take you less than 10s to finish it if you were using SSD. Now reboot your system and hold option key to boot in 1014MBR18A391. It will automatically finish the rest of the installation. And voilà ! You now have a working Mojave running on HFS formatted drive. As a bonus, you can even deploy the image with DeployStudio ! 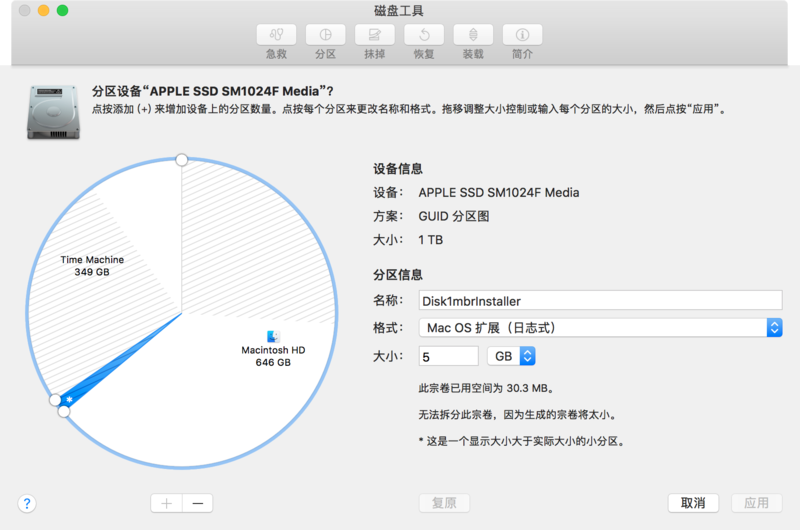 It could be achieved by removing Harddrive/SSD and installing macOS externally with a USB to SATA cable. Not the answer you're looking for? Browse other questions tagged macos apfs mojave . In macOS 10.14 (Mojave), can Finder remember previously opened tabs like Safari pin tabs?